Recently, Mr. Peacock interviewed me on his blog and asked me what my favorite article of clothing was. Later I thought, I should have mentioned the cardigan, the sweater that buttons up the front. 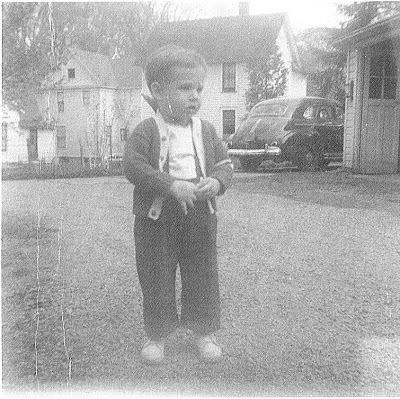 That's me, age two or three, in a scan of a xerox of a photo, but you get the idea. Cardigan sweater, white shirt, wool trousers; that is what I am still wearing today. Named after the English Lieutenant General James Thomas Brudenell, 7th Earl of Cardigan (1797 – 1868), who made the knitted waistcoat fashionable, the cardigan is a classic that has recently come back into style again and I'm glad of it because I've been wearing them for years. When I first moved to New York City I worked as a chauffeur for Mr. Perry Ellis, but that's another story. Though I will say that's where I first met friend Richard Haines who has a great blog, What I Saw Today. 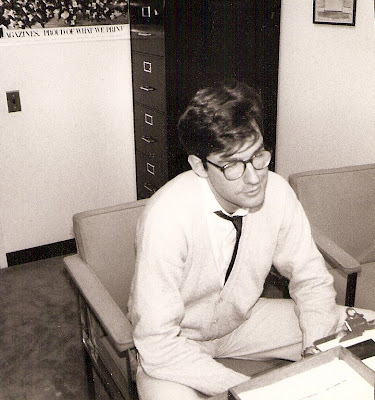 After that job I worked as a communications assistant at CBS Magazines and one day I was in the elevator with Ellen Levine, who was then the editor in chief of Woman's Day magazine. She pulled her glasses down to the tip of her nose and eyed my navy blue cardigan -- hand knit with a ship's wheel logo and shiny gold buttons. I am keeping this sweater, unless Harold Koda wants it for the Metropolitan Museum Costume Institute. While I was in the chest I came across this cardigan which has a Fair Isle pattern and silver metal buttons. I love this sweater which belonged to my uncle Brian, who is a lawyer in Albany and has wonderful style. He gave it to me and I wore it when I was in law school, but that's really another story. At CBS Magazines, I also had a pale pink linen and silk Perry Ellis sweater, pictured below -- a summer version of a cardigan. I kept this one too. I don't hold on to a lot of clothes, but I have my Perry Ellis sweaters. 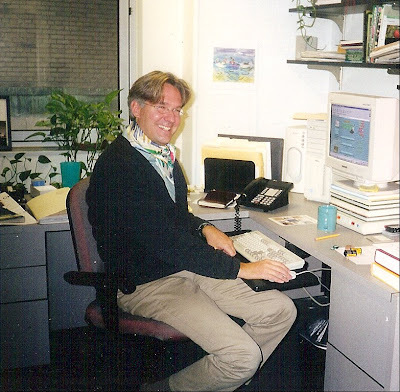 This is me working at Hearst New Media where I was the online style editor in the 90's. Cardigan sweater plus Hermes scarf. With their buttons, cardigans are kind of like a jacket, but more comfortable and fluid than a jacket. Cardigans can be buttoned or unbuttoned depending on the temperature so they are more versatile than crew neck or v-neck sweaters. And they have more polish than a zip up sweater. You can tuck a short scarf into cardigan, and wear them with everything from jeans to a suit jacket. Cardigans are best when they are in a fine fabric like merino wool, and fit close to the body. If they are too big and bulky it can look like Mr. Rogers. Worn with a French cuff shirt and horn rim glasses, they have a slightly professorial air which I like too. Here is actor Hugh Dancy in chic Gucci clothes in GQ magazine; photo by Nathaniel Goldberg. We're back to a cardigan sweater, white shirt, wool trousers. He reminds me of Jude Law in The Talented Mr. Ripley, very 50's. Cardigans are casual sweaters but the deep v-neck and the drape of the buttons give them an elegant aspect; they're kind of Chanel-ish. Simple and soigne at the same time, they are open and easy and conducive to personal style. Fashion legend Polly Mellen told me that when she was a girl at Miss Porter's School in Connecticut she had a Brooks Brothers cardigan. But she wore hers backwards. great story and thanks for mentionng me and the blog. i love that you have kept the perry ellis pieces. thos cardigans are amazing.i had a flashback when i saw the one with the ship's wheel! Wonderful post and weren't you the perfectly natty fashionista. 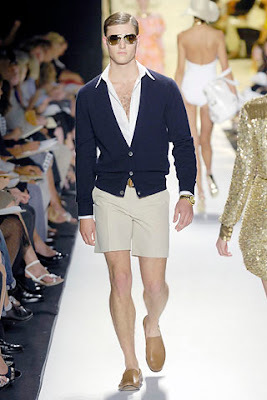 Loved Jude Law and his attire in the Talented Mr. Ripley and who can forget "the man who invented casual,"
I have about 10 cardigans, including one I keep in my office on the back of my chair (a 150 yr old converted flour mill gets COLD!). I get so many compliments on my 'mr. rogers' sweaters! I love your stories about working in New York! And the photos are wonderful too! The Perry Ellis sweater is divine...it looks like you could have purchased it this year...very au courant! I have an old navy Izod/Lacoste cardigan, with pockets and shawl collar, that was my father's...I wear occasionally. so many untold stories....do tell. Bart, you were a beautiful baby who grew into a very chic man! Love the cardigan story. Love cardigans on men. It's so old-school cool it's ridiculous. There is no more instantaneous way to be stylish, methinks.